ASTEROCERAS WITH BITE - JURASSIC LYME REGIS. Nice 3D calcitic Ammonite in the center of a beach pebble. Developed to the center. Half way round the outer edge of the last whorl is a circular area of shell 0.8 cm in diam. which is missing. These holes are now interpreted as puncture wounds or bites from a large fish or a marine reptile. Back of the pebble has been polished. Nice example. Black Ven, Charmouth / Lyme Regis, Dorset. 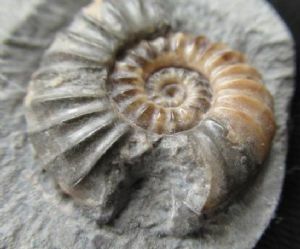 Ammonite : 3.8 cm. diam.